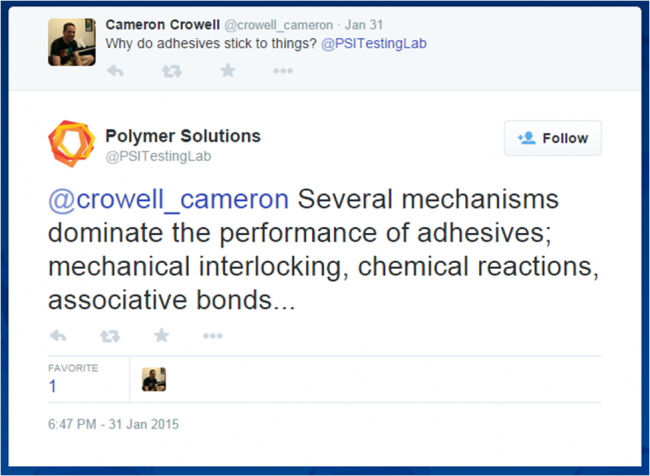 The quick answer is that adhesives stick based on one of three bonding mechanisms. The mechanisms include: mechanical interlocking, the formation of chemical bonds, and electrostatic or associative attraction, including hydrogen bonding. Let’s dive into this question with greater depth, beyond what can be communicated with 140 characters. Chemical bonds: This type of bond is typically the strongest and the most durable. In order for it to occur, the adhesive and adherends must have mutually reactive chemical groups. A great example of this is the use of a silane to react with glass, for example, attaching the plastic mount of your rear-view mirror to your windshield. Coupling agents are also used to create chemical bonds and adhere two materials that aren’t compatible otherwise. The coupling agent functions by reacting with the two materials and joining them. A great example of this the use of a coupling agent to bond the end of a silicone spatula to a nylon handle. It creates a more complete seal by chemically bonding the two materials together and creates a strong solution. Mechanical Interlocking: This occurs when an adhesive flows into porous openings of the adherends or flows around protrusions from the surface of the adherends. Of all forms of adhesion this is generally considered to be the weakest. A simple and “everyday” example includes the use of Elmer’s glue to stick two pieces of construction paper together. The glue flows into and encases some of the paper fibers, hardens, and attaches the two surfaces together. Although this bonding mechanism is described as the weakest it can still serve incredible purposes. For example, a recent medical device innovation was built around the concept of mechanical interlocking inspired by a parasite. This bio-Inspired microneedle adhesive patch interlocks with tissue by penetrating the tissue with thousands of microscopic cone shaped needles that are also able to elute therapeutic compounds. This is truly an amazing application of mechanical interlocking. Electrostatic Attraction—or hydrogen bonds. This mechanism can be summed up by the old adage, “opposites attract.” The adherends are joined as a result of polar molecules and the opposite charges that create attraction. As the surfaces get closer, the force of attraction increases. This can create a challenge if you can’t get the substrates (surfaces) very close because then they just won’t stick. Polar forces also play a role in other bonding mechanisms because they are often used to create a stronger bond and prevent polymers from simply sliding past one another and detangling. 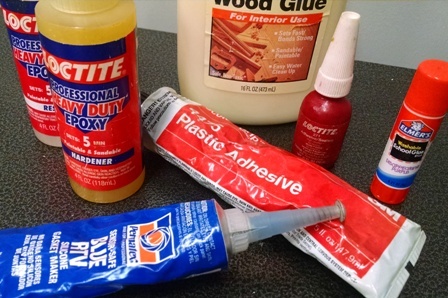 Understanding basic bonding mechanisms is critical for selecting the proper adhesive for a desired application. Also, failure analysis of adhesive systems often starts with understanding and evaluating the intended bonding mechanism. Thanks for that great question, @crowell_cameron!